This magnificent piece of canvas portrays Lord Shiva along his family revered universally as the 'Holy family'. The Shiva family consists of his consort Parvati, his two sons, the elephant headed Ganesh and the five headed Karttikeya and four family pets, Lord Shiva's Nandi, Parvati's lion, Karttikeya's peacock and Ganesh's mouse. 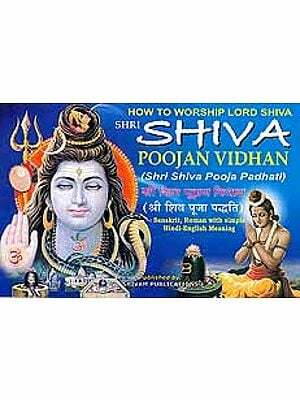 Lord Shiva is simplicity incarnate, hence his epithet Bholenatha. A temple, shrine, seat, throne, chariot or a high pedestal did not much constitute an aspect of Shiva's iconography. 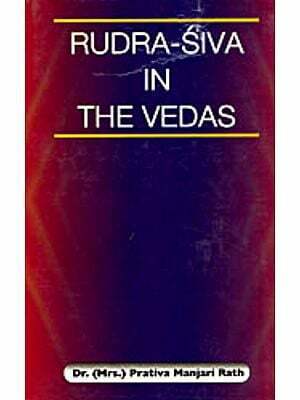 He is best conceived, as here, in his unassuming simplicity, an 'aughada', a simple, plain and strange looking God, or yogi sojourning around a hill-top, camping anywhere, or descending a terrain usually a Himalayan hill side. He is much like a nomad. For him a large tree is his tent, lion or elephant skin his couch, a water pot and another for mouse and a few other articles his house-hold goods, 'damaru', a small drum, his entertainment, snakes his ornaments and fire, water, wide earth and open sky his surroundings. The location in the present painting is a mound adjacent to a lake symbolising Mount Kailash and Manasarovara. Night has set in and darkness has enshrouded the earth. Parvati, Karttikeya, Ganesh, Lord Shiva, lion, peacock and Nandi all have fallen asleep or are drowsing. The greedy mouse alone awakes to feed itself from its bowl. Nandi, the faithful servant of his master, lying fully stretched by the side of Lord Shiva, even in sleep is seen supporting his drowsy master. The animal serves both Shiva and Parvati as a bolster to recline against. Parvati is reclining supported upon her lord's thigh and Nandi's rump. 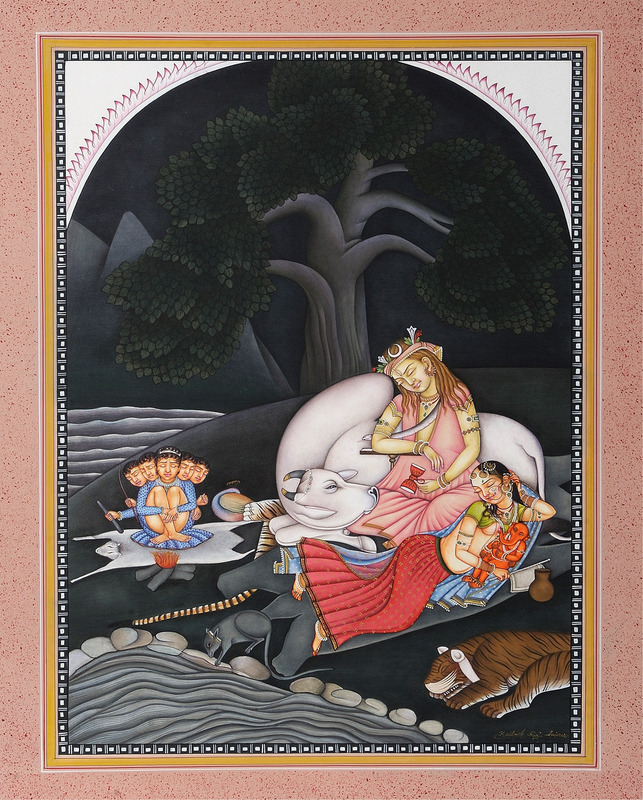 Ganesh, lying by her side, is suckling milk from his mother's breast, though she is unaware of it. Karttikeya sitting by fire goes asleep with its warmth. Parvati's lion too is fast asleep. The depiction of serenity of the surroundings and the celestial glow on all faces is exceptionally powerful. An exactly similar painting was rendered in early 18th century by a Mandi artist Sanju. He was initially at Kangra at Raja Sansar Chand's court but around 1808 shifted to Mandi to found his own school of painting there. Sanju developed his own art style, a blend of delicacy and finish of Kangra, directness of execution of Mandi and folk element of his own. Sanju's painting of Shiva family was par excellence and a great example of his art style. In its execution and finish the painting of Kailash Raj too is par excellence. For its art merits, appreciation and aestheticism it does not beg any favour of its proto-type. It is independently a great work of art. This description by Prof. P.C. Jain and Dr Daljeet. Prof. Jain specializes on the aesthetics of ancient Indian literature. Dr Daljeet is the chief curator of the Visual Arts Gallery at the National Museum of India, New Delhi. They have both collaborated on numerous books on Indian art and culture. the Miniature Paintings Gallery at the National Museum of India, New Delhi.